Largely overlooked in the scrum of media reporting about the release of the documents, the presentation of the award in London on Saturday saw Assange and Wikileaks join a distinguished group of former winners honored for having “the courage to speak truth to power.” Moreover, when Assange was told earlier this year that he would be this year’s recipient, he made a point of stating that he could only accept it on behalf of the unknown sources who have risked their careers, and their freedom, to reveal the information. 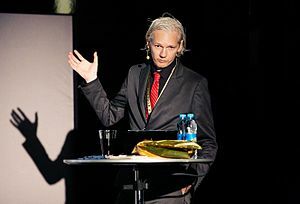 “I am proud to be in such company, but, permit me to accept the award on behalf of our sources, without which Wikileaks’ contributions are of no significance,” Assange said. Below is the Award Citation for the presentation of the 2010 Sam Adams Award to Julian Assange and Wikileaks. A version of this article was published by Ray McGovern of SAAII on Consortium News. Sam did precisely that, and in honoring his memory, SAAII confers an award each year to a lamp lighter exemplifying Sam Adam’s courage, persistence, and devotion to truth — no matter the consequences. It was Adams who discovered in 1967 that there were 500,000 Vietnamese Communists under arms — more than twice the number that our military in Saigon would admit to in the “war of attrition.” Gen. William Westmoreland had put an artificial limit on the number that Army intelligence was allowed to carry on its books. And in a cable to Washington, Gen. Creighton Abrams warned that if Adams’ numbers leaked to the press, this would weaken the war effort. Westmoreland’s figures were shown to be bogus in January/ February 1968, when Communist troops mounted a surprise countrywide offensive in numbers that proved that Adams’ analysis had been correct. But because Sam was reluctant to go “outside channels,” the CIA and Army were able to keep the American people in the dark. After the Tet offensive, however, Daniel Ellsberg learned that Westmoreland had asked for 206,000 more troops to widen the war into Cambodia, Laos, and North Vietnam — right up to the border with China, and perhaps beyond. In his first such act, Ellsberg leaked Sam Adams’ data to the then-independent New York Times on March 19, 1968. Dan’s timely truth telling won the day. On March 25, President Johnson complained to a small gathering, “The leaks to the New York Times hurt us … We have no support for the war. This is caused by the 206,000 troop request and the leaks … I would have given Westy the 206,000 men.” On March 31, Johnson stopped the bombing, opted for negotiations, and announced that he would not run for another term. This entry was posted in All Posts News Politics and-or Videos, Dandelion Salad Featured Writers, Iraq, Iraq on Dandelion Salad, Media, Politics and tagged Andy Worthington, Assange-Julian, Bradley Manning, Chelsea Manning, Daniel Ellsberg, Ellsberg-Daniel, Iraq War Documents from WikiLeaks, Julian Assange, Manning-Bradley, Sam Adams, Sam Adams Award, Whistleblowing, WikiLeaks, Worthington-Andy. Bookmark the permalink.